It's 9:30 am and we are all gearing up for a full day on the throttle. The boys are warming up their bikes and the air hangs heavy with the smell of fuel, oil and the eager anticipation of the day ahead. For some, it is an escape from the trials and tribulations of every day life, for some it is a race that lasts the whole day, and for some it is the feeling of adventure you get from riding to a place so remote it can only be easily reached on a trail bike. Whichever way you look at it, dirt bike riding is a lot of fun for anyone who is willing to give it a go. Shaun, Andy and I have been riding together for a few years now and our desire to seek out new places to explore has taken us to many different parts of Victoria . We have found a myriad of tracks that ride very differently at different times of year. We have found some spectacular views, fishing spots, camp sites and terrain that forms jumps and berms the likes of a freshly prepared motorcross track. We believe it is this sense of discovery that keeps us returning again and again to the forests and bush land of Victoria . After we exhausted all our local knowledge on places that we could ride we turned to the Melbourne Map Centre in Chadstone in the hope of finding a book on the subject. 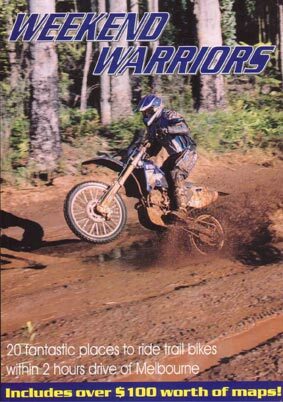 Sure there were 4wd discovery books and even a few mountain biking books, but there were no books directed specifically at trail bike riding. Now I can't be 100% sure of the facts, but if I were to take an educated guess, I would have to say that there are more dirt bike riders than 4wd'ers and mountain bikers combined. We were stunned to learn that we dirt bike riders had been so obviously neglected and we resigned ourselves to reading our own maps and finding our own places to ride. After a while our friends began to call to ask us where they could ride and which places are best when it's wet or dry etc. Well, it didn't take a brain surgeon to work out that something needed to be done about this so we took matters into our own hands, and this is what we have come up with. This book is intended for all those weekend warriors that have run out of places to ride. For all the people that have ever asked the question, "Do you know any good places to ride?" And for all the people who have just discovered the rush of dirt bike riding and don't yet posses the local knowledge required to put them in the best location to learn the skills required to be a part of this increasingly expanding sport. So the next time you hear someone ask, "Do you know any good places to ride around Melbourne ?" Tell them about this book and save them the time and effort it takes to find fresh tracks to rip up.